The Malibu Arts Festival promises to offer something for everyone. 45 years of incredible high-end art, 45 years of beauty, 45 years of a wonderful event – known world wide! Produced by the Malibu Chamber of Commerce, the two-day weekend event will take place July 30-31, from 10 am to 6 pm, in front of the Malibu Civic Center. The Optimist Club of Malibu will be serving a pancake breakfast at the site starting at 8 am. Fine Art including Paintings, Photography, Sculpture and Alternative Artwork. Stroll the aisles, meet hundreds of artists, and pick up something for your home or office. Open your eyes to the Wide World of Art and where it’s heading in the future. The right piece of artwork can transform any room and make you smile everyday! Fashion and Jewelry featuring many local up and coming Los Angeles/Malibu clothing and jewelry designers. Shop the latest cutting edge styles and grab some lunch from one of the food trucks while watching the live daily 8-hour fashion show on the 100ft catwalk, and maybe even go home with a henna tattoo. Arts in Education featuring top-rated art schools, art programs and budding student artists. Pick up some information for the budding artist in your household, chat with teachers, and watch each schools top students creating masterpieces before your eyes. Local Malibu students featured throughout. Purchase some student art that might just be worth millions someday! Music & Theatrical Arts highlighting bands, DJ’s, music students and local theatre groups. Picnic on the grass or hang out in the wine and biergarten, while listening to great bands and dj’s, and check the schedule for 3 daily theatre performances by local students and seasoned actors from the area! Crafts Corner hand-crafted items of all kinds, offered by some of the most creative talents in the country. Watch as some of the crafters create before your eyes, pick up some gifts for birthdays, graduations or just something for yourself…you deserve it!! Kids Village featuring fun for all ages, it’s a family affair. Bring the entire family for cookie decorating, face painting, chalk art, petting zoo and more…Visit with vendors offering all types of items for your little ones. The Malibu Arts Festival also includes an entertainment stage where original musicians perform each day, a children’s workshop where kids work with artists to create their own art, and a food truck terrace featuring exciting menu items with incredible cuisine. Need to stay overnight? Call our friends at the Four Seasons Westlake or the Anza Hotel in Calabasas for special room discounted pricing. New to the Malibu Arts Festival? Applications for artists that would like to participate in the Malibu Arts Festival should visit: https://www.zapplication.org/event-info.php?ID=4828 . The Malibu Arts Festival is a juried event. Returning to the Malibu Arts Festival? Are you a Malibu Chamber Member & interested in participating? Please read this welcome letter from our Festival Chairwoman. 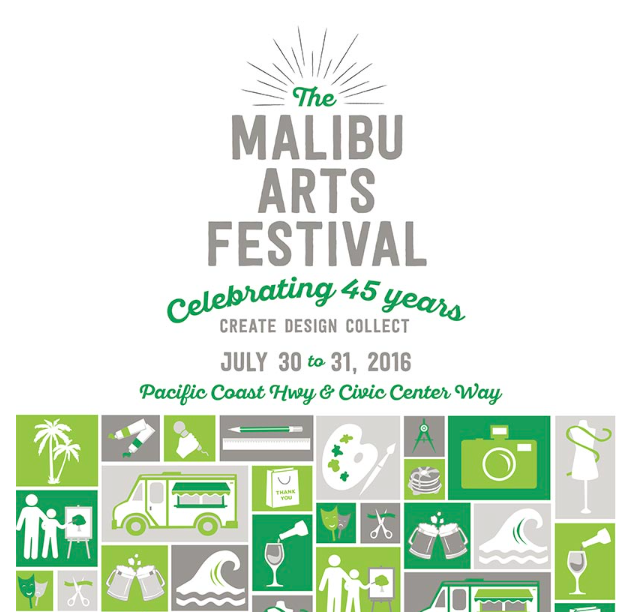 Interessted in Sponsoring the Malibu Arts Festival? Simply email info@malibu.org and we will send you all the details you need to know. Watch us on Facebook and Twitter for more postings and updates.